Mini Productions in association with First Person Productions present Bad Mother is a chilling tale of every parent’s nightmare. It’s a film about trust, fuelled by fear and prejudice. It’s about our warped relationship to strangers in this modern world and the decisions we make every day to keep our children safe. 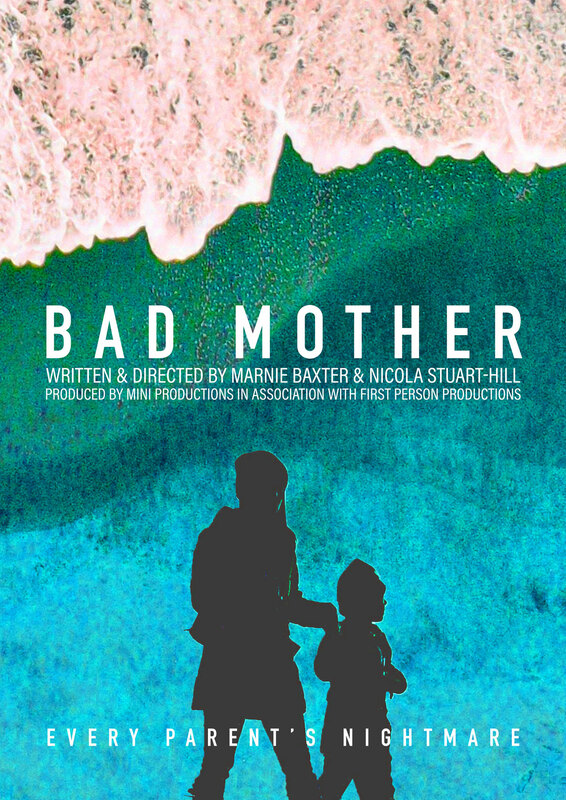 Bad Mother is the written and directorial debut for Marnie Baxter and Nicola Stuart-Hill. Both women have over 20 years experience in the industry as actors spanning across film, television and theatre. Executive producers include the undeniable talent that is Linda Marlowe, who worked with Steven Berkoff over a twenty-five year span as his leading lady in most of his plays, touring internationally and in Londons West End. Her association with him gave rise to her first solo show, Berkoff’s Women, directed by Josie Lawrence. Other credits include Big Zapper, Beckett, Manifesto and Day of the Dead. Sam Emmery is also executively producing, who has en extensive career in factual content. The feature-length documentary A Very British Gangster, was selected to play in competition at the Sundance Film Festival before being released theatrically. Since then he has produced and directed numerous observational documentaries for broadcast television, including the BAFTA nominated first series of Big Fat Gypsy Weddings. Sam is currently working as an Executive Producer at Firecracker Films and his recent credits include Secret Life of the Human Pups and The Brit Who Tried to Kill Trump. Based on the true story of Marnie’s experience, the film is about society’s lack of trust in strangers, and how this affects our sense of community. How quickly Grace regrets leaving her children with this stranger for ten minutes. And how quickly she decides that Jenny has planned something terrible. Would our grandparents have had the same fear about leaving their children? Is it because in today’s world we are told that we must watch our children at all times, that strangers are a threat, not an opportunity. We don’t allow our children out of our sight – they can’t play out in the streets, or go to the park alone as it’s considered by society to be unsafe. Is Grace’s reaction a sign of the times? It is also about being a mum – the intuition we have as parents, we are told, is often what keeps our children safe. We talk about a mother’s instinct, or our gut reactions. A mother’s intuition is never wrong. But what if we do get it wrong? If all this is true, we only have ourselves to blame. And as the sense of community within society decreases, the isolation that one can feel, especially when dealing with small children day in day out, can only ever increase. It’s a roller coaster ride for the audience as much as it is for our central character. Our hope is that our audience will leave the film thinking about how we see strangers in the world today, wondering what they would have done in that situation. Was Grace right to leave? And is it possible to trust a stranger in the world today? Grace is driving. Her children, John and Olivia, are fighting in the back. Losing patience, she screeches the car to a halt, grabs their sweets, and throws them out of the window. When she looks up, she sees a sign for ‘Mullion Beach’. Feeling guilty about the sweets, she decides to take the children down to the sea. The beach is empty and beautiful. The children run around shouting and screaming and laughing, whilst Grace enjoys the peace. Moments later, she hears some other children, Keris and Ella, arrive and stand watching her two play. Grace can’t see an adult anywhere, so goes over. They say their Mum is just coming, and when Grace looks she can see a woman, laden with a baby and loads of beach stuff slowly making her way towards them. Grace suggests to John and Olivia that they go for a walk, but they won’t budge. She decides to engage with building the castle, trying to avoid the impending small talk with a stranger. They discuss where they might be able to create a secret garden. Grace says all castles have secret gardens, but that only the castle’s family can see them. The stranger finally arrives, plonks herself down on Grace’s coat and begins to breastfeed. This is Jenny. She is very tired and doesn’t have any control over her children, who run around her noisily. Grace tries to ignore the noise politely. Later, Grace is down by the sea washing her hands and Jenny joins her. Grace explains that she on her way to visit her mother. Jenny with adoration, guesses that Grace is from London, which makes Grace self conscious. Keris comes down to ask for something, Jenny ignores her but eventually has to tell her to go back. Jenny’s baby starts to cry, so the conversation is cut short. Later, Grace is back with the group when Keris and Ella start whining for chips. The baby starts crying. Grace can’t take this noise. Jenny feels this, anxious as her chance for adult company is in jeopardy. Grace offers to get chips, as it’s the only thing that will stop the noise. And because this situation is unbearable for her. Jenny gets money out of her pocket and a twenty pound note falls out, which she quickly stuffs back without Grace seeing. Grace is making her way on the path, clearly a way off from the beach, and still hasn’t found a chip shop. She is worried about whether to keep going or not. Jenny puts the baby down, goes over to the children and starts to say something to them. Grace’s phone rings – it’s her mum. Grace apologises for being late, but says she’s on her own and she’s doing her best. She says she’s on a chip run and the kids are with a pretty annoying woman.. Suddenly she becomes aware of what she’s done and hangs up. Silence is all around her. She begins to run as fast as she can back to the spot she left her children. There’s no-one there. Panicking, she starts running around the beach, looking. She runs around a jutting rock, and straight into her children, who have been collecting shells. She scoops them up ‘Thank God..’ Jenny, who is a little way off, watches this. She knows what Grace thought and is gutted. Grace tries to make up for it by saying she couldn’t find chips and will go back. But Jenny is too upset. She gathers up her children and leaves. Grace goes over to the sand castle and sees that they had begun to make a beautiful shell garden. She feels terrible. We watch her deal with the shame. Grace is driving. The car is quiet and calm – the children are eating ice creams. Out of the silence, Olivia says ‘I wanted to see the shell fairies” and when Grace, amused by this sweet announcement, asks her where she would find them Olivia says “In that lady’s secret garden. She was taking us there”. We end on Grace, processing this, quietly in the car. Was Jenny innocent or not? We will never know.